Tennis elbow (lateral epicondylitis) is an irritation of muscles and tendons in the forearm — and it is not necessarily always due to someone having played tennis. Tennis elbow can occur from any variety of exercises, sports, household chores, or computer use. Any activity that has repetitive motion may be the reason for tennis elbow. Tennis elbow is often seen in gardeners, carpenters, golfers, dentists, musicians computer professional, and other professions, as well as those who may play tennis. 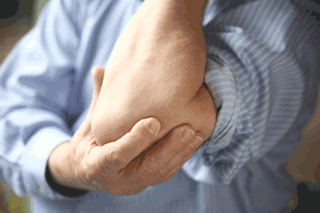 The main symptom a person has is pain – especially when moving their arm, or lifting objects. There is usually tension around the elbow, along with the pain, and there may be a weakness in the arm, or hand, as well. With the pain comes inflammation. The inflammation may be caused by micro tears in the tendon and muscle tissue. Early stage there may only be some minor weakness or minor pain, but as the condition progresses, pain will increase. Many times, before trying acupuncture, a person may have sought medical help that resulted in cortisone shots, physical therapy, or wearing braces. These approaches may bring some initial relief. But often times, despite these efforts, the person may still be in pain. Acupuncture can help with the pain of tennis elbow. Acupuncture can reduce pain, relieve inflammation, encourage blood circulation and speed healing. Techniques may include needles around the affected area, moxa, cupping, electrical stimulation and, or therapeutic exercises. Treatment will depend on the patient and the severity of the problem. Various industry reports have shown that patients with symptoms who utilized acupuncture were relieved and did not again show symptoms for several months afterwards. Of course, it will be important to also try and determine why the condition originally occurred and do what is necessary to avoid continually aggravating the muscles and tendons of the arm. The individual needs to ask themselves if the activity that lead to the problem can be modified and changed to try and minimize stress to the arm. Are you experiencing pain in your arm? Consider Acupuncture to help you be rid of the pain and back to doing the things you need to do.